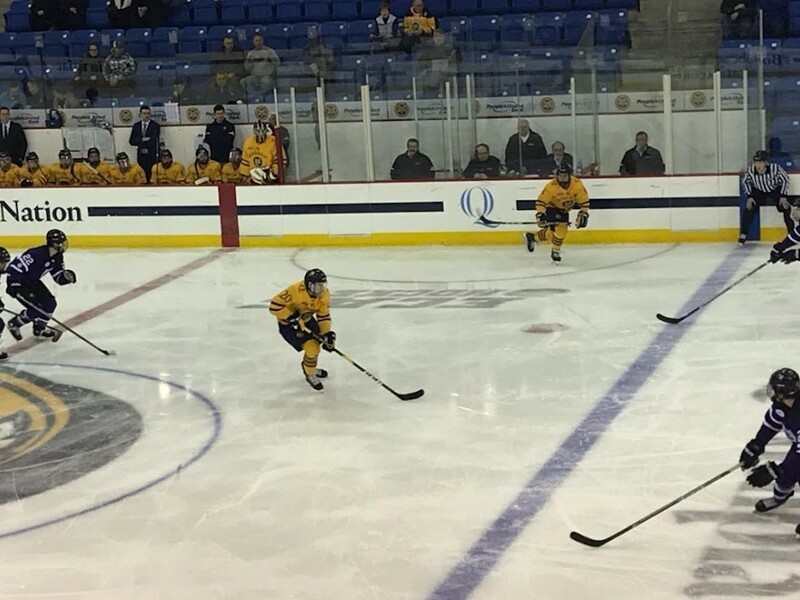 Quinnipiac wrapped up non-conference play with a 4-1 win over Atlantic Hockey foe Holy Cross who sits in last place in their respective conference. The Bobcats got goals from Desi Burgart, Alex Whelan, William Fallstrom and Brandon Fortunato to pace their victory. Here are my thoughts and observations from the game. - Quinnipiac cleaned up on its non-conference portion of the schedule going 11-1. The only loss was against then #1 UMass on the road but Quinnipiac beat UMass the prior night at home to split with the Minutemen. Prior to the season it was thought that the Boston College and Boston University games would have the biggest pairwise implications. Neither was the case and while Quinnipiac swept those two teams, both are having down seasons by their expectations. It was the UMass games that helped improve the pairwise for Quinnipiac which was not something we saw coming prior to this season. The great record in the non-conference slate has set the Bobcats up to make a return to the NCAA tournament after missing the previous two seasons. Now they just have to finish this season strong. - I thought with a weaker opponent that we might see Keith Petruzzelli in between the pipes against Holy Cross. Andrew Shortridge made his 7th straight start in goal and was very solid once again with 25 saves on the night. The only goal allowed was when he misplayed the puck behind his own net which cut the Quinnipiac lead to a single goal. Plays like that can't happen especially when you play better competition. The Bobcats are lucky that Holy Cross is a weaker opponent or that play could have come back to bite them. We saw just how these types of plays can bite a team as it happened twice to Quinnipiac in National Championship games when in 2013 Eric Hartzell turned the puck over late in the second period and Yale broke the scoreless tie with four seconds left on the clock. In the 2016 National Championship game, Michael Garteig turned it over on the Quinnipiac power play to Brock Boeser who scored easily to give North Dakota a 2-0 lead. - Alex Whelan continues to show why he is an important player on this team. He always seems to be in the right places at the right times, hunts pucks, and gives a ton of effort. Last night he was rewarded with a goal and an assist and now has five points in his last four games. He is also closing in on his career high of points in a season at 19 as he currently has 17. 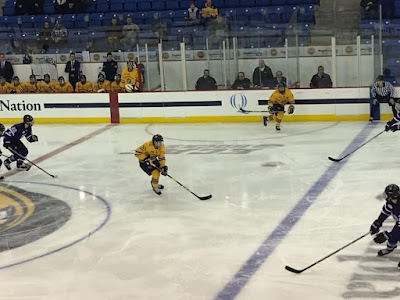 - It wasn't the cleanest performance last night as this was a game in which Quinnipiac should have won by a lot more than they did. Give Holy Cross some credit as they didn't make it easy at times for Quinnipiac and Tommy Nixon played solid in goal for the Crusaders. - After two games with no power play goals, the Bobcats last two goals came by way of the man advantage on goals by William Fallstrom and Brandon Fortunato. In order to have continued success, Quinnipiac cannot go multiple games without scoring on the power play. - A day after being named the ECAC player of the week for his two goal, one assist performance against Boston University on Saturday, Brandon Fortunato had another goal in the win over Holy Cross. He has been a force for Quinnipiac in the second half with three goals and six assists in his last six games. There is a good chance he could get to 40 points by the end of the season at this pace. - Credit to the coaching staff and the captains on the team for not taking Holy Cross lightly in lieu of the big 4-3 win over Boston University on Saturday. Sometimes teams after a big win slip up the following game and while it was not the best game they have played this season, they did enough to get the win and that's all that matters. - Odeen Tufto has been held scoreless in the last three games for the first time all season. While I don't expect that to continue it is something that bears watching especially with some of the big games that Quinnipiac has coming up with Clarkson (2), Yale (2) and Union. He is such an important player for the Bobcats and someone they need to score in big moments against some of these top teams remaining on their schedule. - Quinnipiac won't see the ice again until February 1st when they have a big showdown at Cheel Arena against Clarkson in the annual North Country trip. These two teams along with Cornell and possibly Yale will battle for the Cleary Cup as the regular season champion of the ECAC.